"Wanderjahre" redirects here. For the modern practice of taking a year off before entering university, see Gap year. The journeyman years (Wanderjahre) refer to the tradition of setting out on travel for several years after completing apprenticeship as a craftsman. The tradition dates back to medieval times and is still alive in German-speaking countries and in France Compagnons du Tour de France. In the British Isles the tradition is lost and only the title journeyman itself remains as a reminder of the custom of young men travelling throughout the country. In medieval times the apprentice was bound to his master for a number of years. He lived with the master as a member of the household, receiving most or all of his compensation in the form of food and lodging. An apprentice could not charge a fee for his day's work (the French word journée refers to the time span of a day); in Germany it was normal that the apprentice had to pay a fee (German: Lehrgeld) for his apprenticeship. 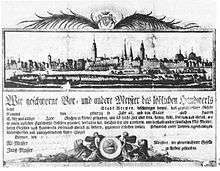 After the years of apprenticeship (German: Lehrjahre, literally "teaching years") the apprentice was absolved from his obligations (German: Freisprechung, "being declared free"). The guilds, however, would not allow a young craftsman without experience to be promoted to master - they could only choose to be employed, but many chose instead to roam about. In parts of Europe, such as in later medieval Germany, spending time as a journeyman (Geselle, literally "companion", or in France, compagnon, with the same meaning), moving from one town to another to gain experience of different workshops, became an important part of the training of an aspirant master. Carpenters in Germany have retained the tradition of travelling journeymen even today, although only a small minority still practise it. After almost having disappeared at the end of the 19th century, the compagnon tradition still is quite alive in France - although, it is also practiced only by a minority, and seen almost like an elite class of craftsmen (many different skills can be learnt as compagnon). In the Middle Ages, the number of years spent journeying differed by the craft. Only after half of the required journeyman years (German: Wanderjahre, literally "wandering years") would the craftsman register with a guild for the right to be an apprentice master. After completing the journeyman years, he would settle in a workshop of the guild and after some more years (German: Mutjahre, literally "grit [courage] years") he would be allowed to make his masterpiece (German: Meisterstück) and present it to the guild. With their consent he would be promoted to guild master and as such be allowed to open his own guild workshop in town. Travelling book of a German furrier named Albert Strauß in the Kingdom of Hungary of the Habsburg Monarchy in the year 1816. A travelling book of Albert Strauß: Regeln, welche der Wandernde zur Vermeidung angemessener Strafe zu beobachten hat. (rules which the journeyman has to observe to avoid proper punishment). A travelling book of Albert Strauß: Bezeichnung des Inhabers (description of the owner). The tradition of the journeyman years (German: auf der Walz sein) persisted well into the 1920s in German-speaking countries, but was set back by multiple events like Nazis allegedly banning the tradition, the postwar German economic boom making it seem too much of a burden, and in East Germany the lack of opportunities for work in an economic system based on Volkseigener Betrieb. Beginning in the late 1980s, renewed interest in tradition in general together with economic changes (especially after the fall of the Berlin Wall) have caused the tradition to gain wider acceptance. The tradition was brought back to life mostly unchanged from the medieval concept since the journeyman brotherhoods (German: Schächte, literally "shafts") never ceased to exist. The journeyman brotherhoods had established a standard to ensure that wandering journeymen are not mistaken for tramps and vagabonds. The journeyman is required to be unmarried, childless and debt-free - so that the journeyman years will not be taken as a chance to run away from social obligations. In modern times the brotherhoods often require a police clearance. Additionally, journeymen are required to wear a specific uniform (German: Kluft) and to present themselves in a clean and friendly manner in public. This helps them to find shelter for the night and a ride to the next town. 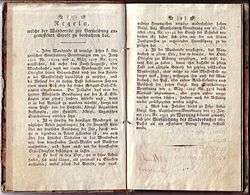 A travelling book (German: Wanderbuch) was given to the journeyman and in each new town, he would go to the town office asking for a stamp. This qualifies both as a record of his journey and also replaces the residence registration that would otherwise be required. In contemporary brotherhoods the "Walz" is required to last at least three years and one day (sometimes two years and one day). During the journeyman years the wanderer is not allowed to return within a perimeter of 50 km of his home town, except in specific emergency situations, such as the impending death of an immediate relative. As of 2005 there were 600 to 800 journeymen "on the Walz", either associated with a brotherhood or running free. While the great majority are still male, young women are no longer unheard-of on the Walz today. Journeymen can be easily recognised on the street by their clothing. 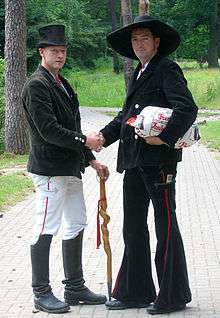 The carpenter's black hat has a broad brim; some professions use a black stovepipe hat or a cocked hat. 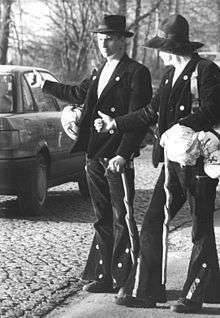 The carpenters wear black bell-bottoms and a waistcoat and carry the Stenz, which is a traditional curled hiking pole. Since many professions have since converted to the uniform of the carpenters, many people in Germany believe that only carpenters go journeying, which is untrue – since the carpenter's uniform is best known and well received, it simply eases the journey. The uniform is completed with a golden earring and golden bracelets - which could be sold in hard times and in the Middle Ages could be used to pay the gravedigger if any wanderer should die on his journey. The journeyman carries his belongings in a leather backpack called the Felleisen, but some medieval towns banned those (for the fleas in them) so that many journeyman used a coarse cloth to wrap up their belongings. While the institution of the journeyman years is original to craftsmen, the concept has spread to other professions. As such, a priest could set out on an extended journey to do research in the libraries of monasteries across Europe and gain wider knowledge and experience. The traveler books or Wanderbücher are an important research source which show migration paths in the early period of industrialisation in Europe. Journeymen's paths often show boundaries of language and religion that hindered travel of craftsmen "on the Walz". The Australian song "Waltzing Matilda" is based on the journeyman's "Walz". There are many wanderer songs based on the "Walz" experience. ↑ Spiegel Online International 05/17/2006 "Craftsmen Awandering"
↑ Sir Robert Harry Inglis Palgrave (1896). Dictionary of political economy. Macmillan and co. p. 491. Retrieved 23 December 2011. ↑ Sabine Baring-Gould (1910). Family names and their story. Seeley & co., limited. pp. 127–8. Retrieved 27 December 2011. ↑ Harry Hastings Pearce (1971). On the origins of Waltzing Matilda (expression, lyric, melody). Hawthorn Press. p. 13. Retrieved 27 December 2011.